Sales volumes are way down. 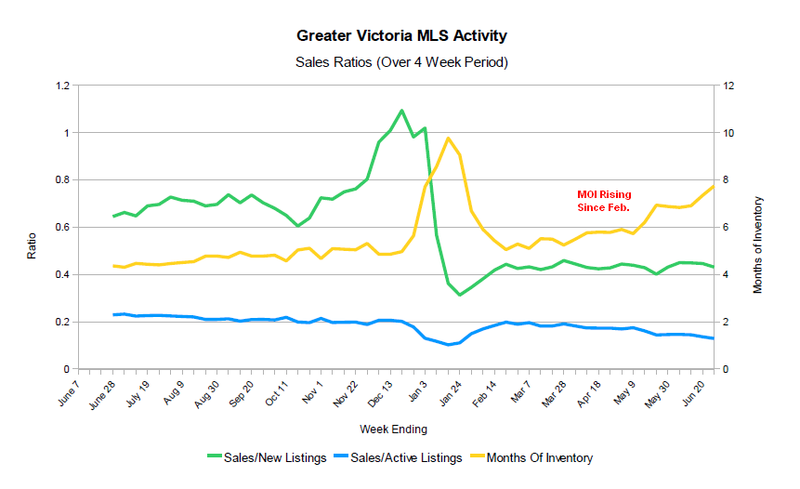 Price changes are creeping through the PCS/Matrix systems of the VREB REALTORS®. Sellers are likely getting frustrated with the lack of attention to their "perfect Victoria properties." Will they de-list and reduce inventory or drop their asking prices in an effort to beat the falling market? 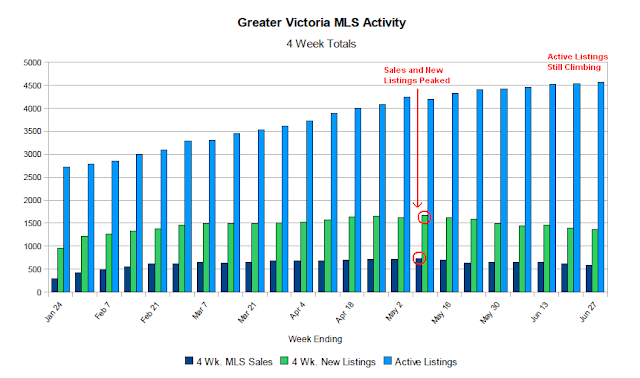 The difference between a seller's market, a balanced market and a buyer's market in Victoria seems to be about 1000 available units - under 3500 units (seller's with rising prices), 3500 to 4000 (balanced, with flat to slight rise) and 4000+ (buyer's with negative price pressure mounting over time) - in the peak selling months of April, May and June. The market will bleed listings for the rest of the year, most likely at the same rate as it loses buyers. The sales to active listings ratio will likely remain below 20% keeping us safely in buyer's market territory even as total listings volumes drop. 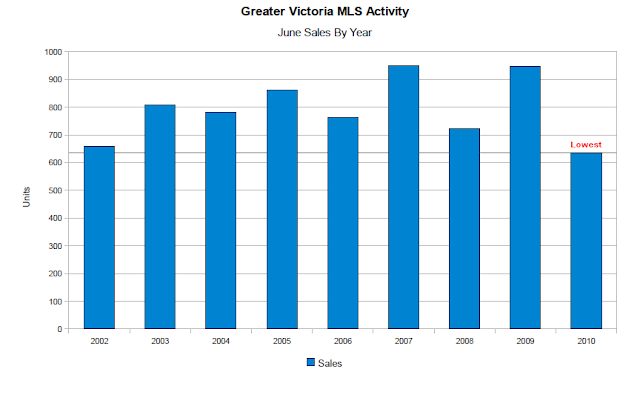 There are approximately 152,482 occupied private dwellings in the Greater Victoria area. Current active listings number 4435 or 3% of total. 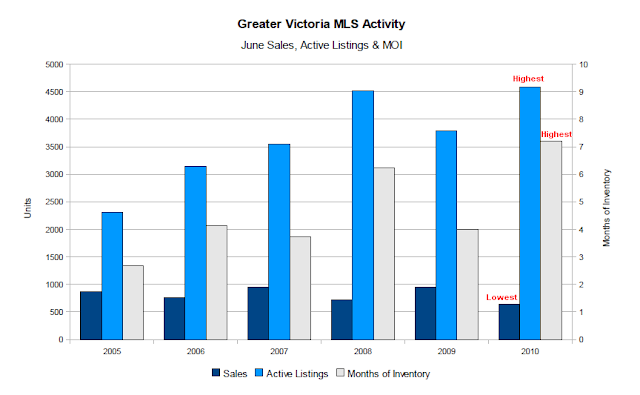 Approximately 3% to 4% of Victoria housing stock is bought and sold each year. I did a quick comparison to another real estate obsessed city, Vancouver, to find that our market turnover numbers are extremely close (within 1%). Do we have a small market - meaning a small number of units changing hands setting the market each year? If so, does this skew the true market value? I'm willing to bet that if these two questions are answered affirmatively, the same forces that skew on the upside will skew on the downside, likely to a very similar degree. Get ready for falling average prices, they are almost guaranteed for the rest of 2010, because the spring selling period is over, and it wasn't a good one. I'll let readers dissect this data in the comments. I'm surprised at the new insights and pleased by having prior convictions confirmed in this information. Most surprising is the number of renters trying to become homeowners for the first time. I'd have thought the low average dollar amount of mortgages would point to a disproportionate number of refinances, not an almost 50% FTBer market share. "The Canadian housing market at one point during last year's parabolic surge in sales and pricing got as much as 20 per cent overvalued. In recent months, demand has weakened under the weight of eroding homeowner affordability. At the same time, the rush of new construction has elevated the supply side of the equation. and so what falls out these shifting demand and supply curves is a reduction in prices - the long awaited correction is here. Remember - excesses in one direction are generally followed by excesses in the other direction. And bubbles never correct by going sideways. In a nutshell, there's more air to come out of this Canadian housing balloon." There you have it. An independent financial expert has stated the Canada-wide real estate market is in a bubble. Victoria is only amplified exponentially. We've got the listings volume. We've got the drastic reduction in sales volume (June 2010 was an 8-year low for home sales and over 30% down from June 2009). It's inevitable that the rest of this year will play out with consistent and perhaps drastic price reductions. It's also inevitable the Victoria Real Estate Board and their friends at the Times Colonist will issue press release after press release proclaiming entry-level condominiums as the number one choice for buyers looking to get into the market or downsize in this decade's Best Home Buying Opportunity Yet™. Carla Wilson. Repeat after me: "I will not write stories that aren't fact checked first." According to my PCS account*, the last time a condo in this segment of the market sold was July 6, 2010. The time before that? May 12, 2010. <sarcasm> Most popular indeed </sarcasm>. * Note: Tim Ayres corrected me in comments. He stated there were 19 2-bed condo units sold between June 1, 2010 and July 8, 2010 and a total of 48 condos priced under $250K sold in the VREB area between those dates, including 1 beds and bachelors, segments of the market I don't track. I trust Tim's data completely. I'm not sure why these sales would not be registered in my PCS account which only excludes Sooke, Metchosin, Saanich North and the Gulf Islands. It could be that their listing prices were higher than $250K but the sales prices fell under that benchmark. These sales represent 3% and 7% of the total market-setting transactions in June 2010. I stand by my original assertion that these numbers do not support the above statement written by Carla Wilson in the Times Colonist. WiseInvestor linked to this article in the comments of the last post. Warren Buffett has famously advised, "You only have to do a very few things right in your life so long as you don't do too many things wrong." For investors considering buying Canadian residential real estate at the moment, this could very well be one of those wrongs you absolutely need to avoid. ...new, high-risk borrowers, propp[ed] up already historically high prices with unsustainable, artificial demand. From 2007 to early 2009, the total dollar value of CMHC's outstanding MBSs grew from $138 billion to $265 billion, an increase of 92%. During this same time, the total mortgage credit outstanding on the collective books of Canadian banks increased by only 1% to $447 billion. In other words, all the market demand that has been propping up Canadian house prices can be attributed to Canada's version of subprime loans that the free market was not willing to bear the risk of. ...key causes of the U.S. housing bubble have been sufficiently replicated in Canada. Thank you Chris Gallant for writing so clearly recently what we've been warning of here at HHV for years. 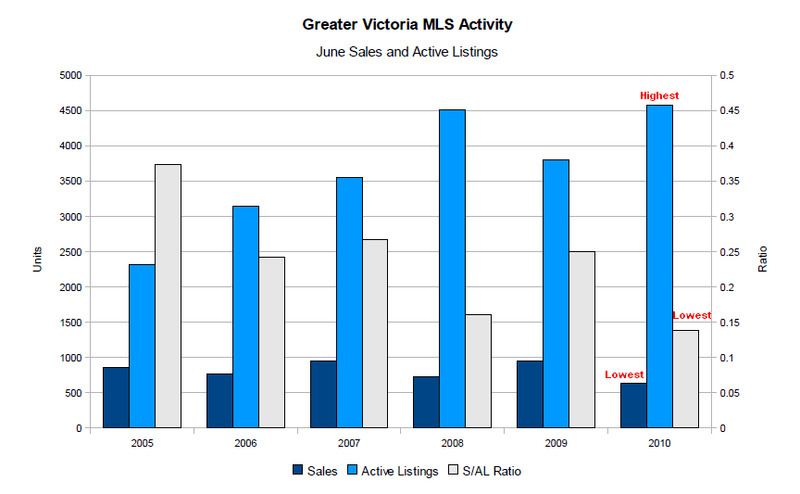 Tomorrow the Victoria Real Estate Board will likely release their June sales data and commentary. They may wait until Monday, but if they know anything about delivering bad news to the public they'll do it on a Friday right after a holiday right before a weekend when no one is paying attention. Of course, they'll find a way to put lipstick on the pig a positive spin on the lowest June sales volume in 8 years - by focusing on average price stability. What do all these graphs point to? Soon-to-be falling average prices due to the overwhelmingly poor supply versus demand ratios emerging in the Victoria real estate market? Check (warning: VREB PDF). Desperate sellers willing to give up two years worth of "equity" to get out of their home? Check. REALTORS® getting called out on a mommy forum (and not by HHV) for trying to pass off a house as a "sure thing" investment? Check (Now removed with no response to the original query, which likely says a lot about the integrity of the REALTOR® in question, no?). Dinner party conversations changing from "buy now" to "sell now"? Check.